In total, this outfit cost me £2.90. When you look at the photos, it may be obvious why. We found a really good home wares shop this weekend called Home Bargains, where I found crepe bandages for 29p each, so I bought 10 and made my outfit! Essentially, I am wearing a strapless dress covered in bandages. 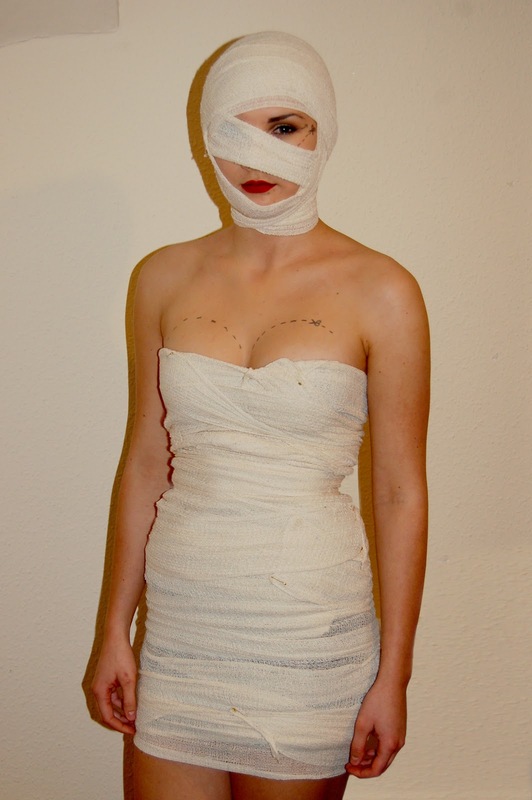 I secured the bandages using little gold safety pins and it did last the whole night, just about. What you can't see in these photos is that I also wrapped my high heels in bandages so they looked a bit like ankle supports, which worked well on the whole. I also drew on "cut here" lines to show that I was a plastic surgery reject and not just a mummy. Most people didn't get what I was and I don't blame them. 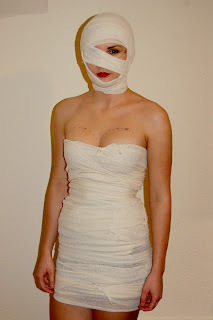 To be fair, I could have just as easily been a mummy or a zombie for that matter. 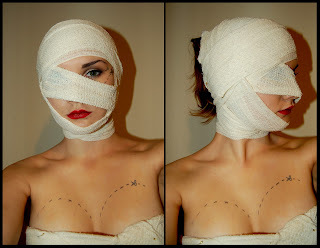 Maybe next year I'll re-use the bandages and do just that! Anyway, here's a close up of my much admired head bandage! And in a break from my traditional written step-by-step, I thought I'd make you a video! The music is The Monster Mash by Bobby "Boris" Pickett & The Cryptkickers. Enjoy!